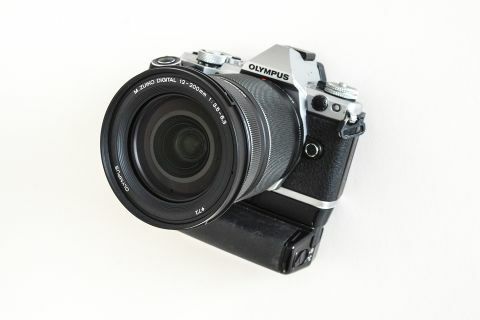 With its 24-400mm equivalent focal range, is Olympus’ 16x superzoom the ultimate travel companion? If you need a single lens to cover any eventuality – whether you’re recording a family holiday, backpacking with minimal kit, or you want a versatile optic that you can also use for shooting videos and vlogs – it’s an absolute no-brainer. This is a lens you can leave on your camera for the entire trip and always be ready to get the shot. When it comes to superzoom lenses, the Micro Four Thirds format really comes into its own. Thanks to the 2x crop factor, manufacturers are able to develop optics with remarkable range that can be literally half the size and weight of equivalent lenses on full-frame systems. Such is the case with the Olympus M.Zuiko Digital ED 12-200mm F3.5-6.3, which squeezes an astonishing 24-400mm equivalent focal range into a lens that’s just 99.7mm long and only weighs 455g. On top of that, it’s weather sealed and features Olympus’ MSC (Movie & Stills Compatible) autofocus technology, offering smooth, near-silent focus for shooting video. All of which makes it, on paper at least, the ultimate all-purpose and travel lens. Paired with a weather-sealed body, it makes a formidable take-anywhere proposition that will survive sandy beaches, frozen mountains and even just April showers around town. With a working distance of 10cm at the wide end and 50cm at the telephoto, it’s a versatile tool that can get the shot in almost any setting or situation. The question is, does the 12-200mm have what it takes to rank among the best Micro Four Thirds lenses? Olympus 12-200mm: The ultimate travel lens? Of course, as with any superzoom, there are compromises. The first one is speed; with a variable aperture of f/3.5-6.3, this really isn’t the fastest lens in the world. You literally won’t be shooting at f/3.5 for long, as the lens hits f/4.2 by 25mm, and you’re already at f/6.1 by 100mm. Depending on your needs, this needn’t be an issue. If you’re taking this lens on your summer travels, for example, the aperture range is plenty fast enough. However, if you’re taking this lens on an adventure where light is at a premium, you’re going to have to crank up the ISO or drastically slow your shutter – and, unlike the M.Zuiko 12-100mm Pro lens, this doesn’t possess Sync-IS, so you’re solely relying on the in-body stabilization of your camera. It goes without saying that the other compromise is optical performance. The 12-200mm doesn’t ‘lose points’ for this, as such, because it’s an inherent property of lenses with this kind of extreme focal range. However, if you’re hoping to get the same kind of sharpness and fidelity from this lens as your Olympus primes, and certainly from the 12-100mm f/4 Pro, you will need to temper your expectations. At equivalent ranges, the lens performs better than standard Olympus kit zooms such as the 12-50mm f/3.5-6.3 or the 40-150mm f/4-5.6 R. Resolution obviously never hits the heady heights of the f/1.8 Premium or f/1.2 Pro primes, but neither is the image quality ever actively muddy or poor. It never reaches pin-sharpness, but it resolves from well to acceptably well the longer you go. The quality becomes noticeably less sharp above 100mm, and optical performance is unsurprisingly stretched when you push it all the way to 200mm. All the while, though, it’s worth remembering that you can go from a 24mm wide-angle equivalent all the way to a 400mm telephoto with the turn of your wrist – that awesome range is what this lens is built for, not awesome resolution. In terms of build quality and the way it handles, the 12-200mm’s compactness belies just how rugged and robust it feels. While it isn’t one of Olympus’ Pro lenses, it feels almost as sturdy and we would have no hesitation taking it out in challenging weather or terrain. While it is positively tiny in full-frame terms, it’s still a sizeable lens for Micro Four Thirds bodies. It was certainly useable with the Olympus OM-D E-M5 Mark II with which we paired it, but handling was markedly improved when we attached the camera’s battery grip. As such, we would recommend using the lens with larger OM-D bodies – and certainly if you intend to shoot at the long end, using a camera with 5-axis (as opposed to 3-axis) stabilization will serve you well. It is tempting, particularly given that it performs best between 12mm and 100mm, to compare this lens to the 12-100mm f/4 IS Pro. This isn’t a fair or realistic comparison; the 12-100mm is a Pro lens, with a Pro price tag (£1,099 / $1,299), and as such delivers truly razor-sharp image quality with a constant f/4 aperture – and with a heftier size and weight. A much more appropriate comparison would be with the M.Zuiko Digital ED 14 150mm f/4-5.6 II (£549 / $599), which feels in every way the predecessor of the new 12-200mm. The image quality – from practical use, if not dedicated lab tests – is very similar, with both lenses possessing weather sealing and MSC focusing. Given the choice between the two, we would opt for the extra reach of the 12-200mm particularly at the wide end. Centre sharpness is very good at 12mm and reasonable at 45mm, as any score above 1500 line widths/picture height is respectable. Diffraction causes a dip in sharpness at f/16 and above, but this is normal for any lens. By 100mm, the optical challenge presented by a 16.6x focal range is starting to show, as from here on centre sharpness is only acceptable at f/6.3 and f/8. Things start off well at 12mm, as the lens manages very impressive corner sharpness for such a wide field of view. however zoom in to just 45mm and you'll need to stop down to f/8 to maintain acceptable detail. Corner sharpness is particularly poor at 100mm and 200mm, but let's face it, you can't have this much zoom range and expect the performance of a prime optic. Chromatic aberrations are well controlled, only being slightly noticeable at 45mm. Fringing is essentially a non-issue at all other focal lengths and lens apertures. These distortion figures should be taken with a hefty fistful of salt, as Olympus applies distortion correction to raw files that can't be disabled. However, our OM-D E-M10 III test body hasn't quite cancelled out all lens distortion at 12mm, as these shots still exhibit some noticeable barrel distortion. Taken for what it is, not what it isn’t, the M.Zuiko 12-200mm f/3.5-6.3 is a great proposition. If you need a single lens to cover any eventuality – whether you’re recording a family holiday, backpacking with minimal kit, or you want a versatile optic that you can also use for shooting videos and vlogs – it’s an absolute no-brainer. Clearly it’s not going to give you the speed or razor-sharp results of prime lenses or more conservative zooms, but conversely those lenses won’t give you the remarkable range that this one delivers. This is literally the equivalent of having the 12mm, 17mm, 25mm, 45mm, 75mm and almost the 300mm lenses all in one optic – less resolving power is simply part of the deal. If a travel zoom with ultimate image quality is paramount, the Olympus 12-100mm f/4 Pro might be a better alternative (particularly with the additional stabilization), though it’s considerably heavier and more expensive. For general travel and travel photography, though, this is a lens you can leave on your camera for the entire trip and always be ready to get the shot.